Exceptional work from the pompiers, no doubt. I'd just caution that the account that first posted that pic on Twitter has since been suspended, but some of it has been saved. Most treasures have seemingly been saved, which is great and it’s not been completely restored. I would guess the emergency services would have prepared for this. Old buildings undergoing renovations are a fire risk. It seems the interior may not have been completely devastated. Amazing. Yes! That looks in a way better state than what I was anticipating- and apparently they managed to get a lot of the artworks and relics out too. Is that a picture taken when the fire was starting, rather than now? the stone roof tracery stopped the walls collapsing inwards. those mediaeval builders did a marvellous job. Mmmm no there wasn't a service, it was a confessions period in English and it was finishing, plus there were very few people left inside because admissions had closed already. Mmmm no there wasn't, the English confessions period had finished and there were very few people left inside because admissions had closed already. Services at Notre Dame are very rare and only happen on special days (holy catholic days). So, from a Monday morning through to Saturday lunch time, the services are as follows..
As mentioned above, the Sunday services start the evening before and therefore the later Saturday services are as follows..
6.30pm - Mass, which is usually conducted by the archbishop and is broadcast live on KTO Catholic TV and via the Notre Dame Radio. In addition to these, after Mass on a Thursday at 6.15pm, the Eucharistic Adoration is conducted that runs through to 7.15pm, however, we would like to point out that this does not take place during July, August and the first half of September. There is also a ceremony style service called the Veneration of the Crown of Thorns and the Relics, which is conducted at the Notre Dame de Paris every first Friday of the month and every Friday throughout Lent at 3pm. Plus this veneration is conducted all day long on Good Friday at Easter. 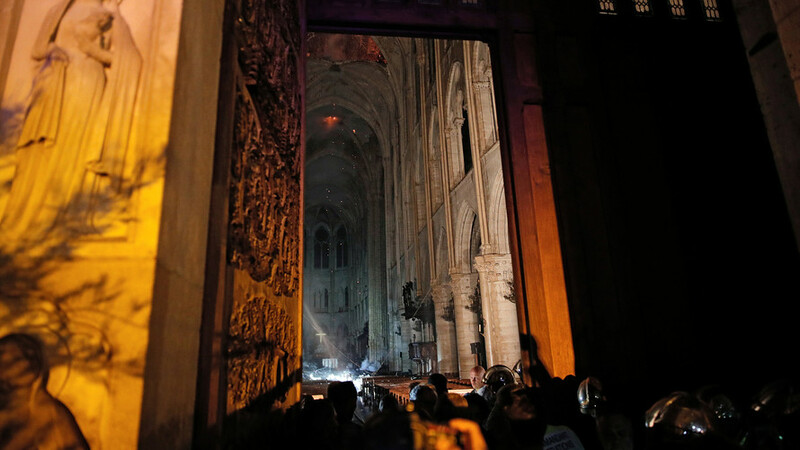 My point is the mass was over when they evacuated at 18.59 (as relayed by all the French news channels) most of those left inside were people inside confessionals. i was just questioning why you thought that 5 services a day and 7 on Sundays was "very rare" and only happened "on special days"
the intricate wooden spire only dated back to 1860, so is not a major tragedy. The spire was still iconic to many people- I understand it may not seem like a tragedy to you, but many of the people of Paris still feel that way. The spire collapsing was quite symbolic, too. it will be quite easy to make a replacement spire. I'm not sure easy is the right word- although I accept that it's much easier than rebuilding the whole cathedral. It possibly also depends on how much of the surrounding roof has been damaged. From the pictures of the inside, I don't think even the clean up will be "easy". For some people, the spire collapsing was a hugely distressing and emotional event, so it's probably kinder not to be dismissive about it. i was devastated by the images from Paris yesterday. it was distressing and emotional for me as well as my fellow Catholics across the world. It's obviously good if the spire can be replaced easily, and it's great that most of the older parts were saved. However, I do think it's important not be dismissive of other people's feelings by not being too dismissive. Part of the reason the spire collapsed so easily is that the renovations in the 1800s weren't really up to scratch and were done with speed in mind- so things may not be as quick and simple to replace as they appear. 1) Kering group that owns the Gucci and Yves Saint Laurent fashion brands, pledged €100m (£86m; $113m) towards rebuilding Notre-Dame, AFP news agency reports. 3) French cosmetics giant L'Oreal and its founding Bettencourt family have promised to give a further €200m to the reconstruction effort. 4) Total, the French oil giant, has also pledged €100m. Oak-smoked Kentucky fried Hunchback anyone? What do people think about notre dam? French policeman stabbed during gas canister car arrests.